حالات الكحه الحادة والمزمنة والمختلفة المنشأ مثل الكحه الحادة والمزمنة الناتجة عن أمراض الجهاز التنفسي. البالغون : ملء ملعقة كبيرة ثلاث مرات يومية . أحيانا قد يحدث إحساس بالدوخة، التعب، الضعف، جفاف بالحلق، إحساس بالعطش، حرقان بالمعدة واضطرابات في الجهاز الهضمي، طفح جلدي. قد يؤثر الدواء حتى في الجرعات الموصوفة على زمن رد الفعل مما يؤثر في القدرة على القيادة والعمل الآلات. - حتى الآن لا ينصح بإستخدامه خلال فترتى الحمل والرضاعة. - يرج جيدا قبل الإستعمال۔ العبوة علبة تحتوي على زجاجة بها ۱۰۰ جم ونشرة. ان هذا الدواء) الدواء مستحضر يؤثر على محتال و استهلاكه خلافا للتعليمات يعرضك للخطر - إتبع بدقة وصفة الطبيب وطريقة الإستعمال المنصوص عليها وتعليمات الصيدلاني الذي صرفها لك . - الطبيب والصيدلاني هما الخبيران بالدواء وبنفعه وضرره . - لا تقطع مدة العلاج المحددة لك من تلقاء نفسك . - لا تكرر صرف الدواء بدون وصفة طبية . 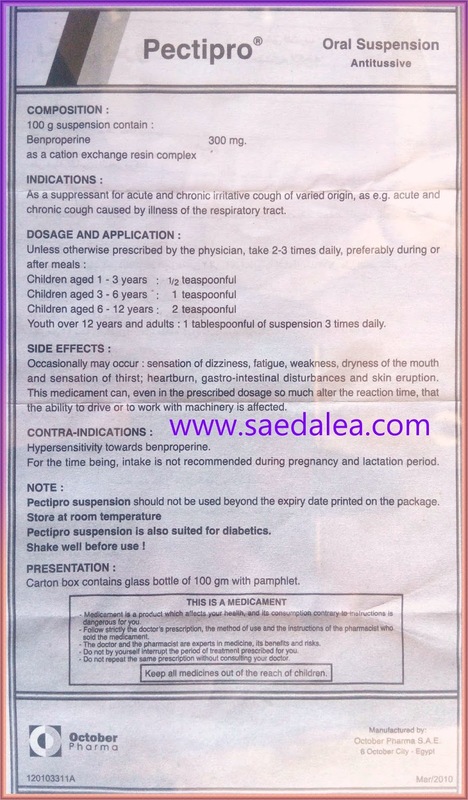 INDICATIONS : As a suppressant for acute and chronic irritative cough of varied origin, as e.g. acute and chronic cough caused by illness of the respiratory tract. DOSAGE AND APPLICATION : Unless otherwise prescribed by the physician, take 2-3 times daily, preferably during or after meals : Children aged 1 - 3 years : 1/2 teaspoonful Children aged 3 - 6 years; 1 teaspoonful Children aged 6 - 12 years: 2 teaspoonful Youth over 12 years and adults : 1 tablespoonful of suspension 3 times daily. SIDE EFFECTS : Occasionally may occur : sensation of dizziness, fatigue, weakness, dryness of the mouth and sensation of thirst; heartburn, gastro-intestinal disturbances and skin eruption. This medicament can, even in the prescribed dosage so much alter the reaction time, that the ability to drive or to work with machinery is affected. CONTRA-INDICATIONS : Hypersensitivity towards benproperine. For the time being, intake is not recommended during pregnancy and lactation period. NOTE : Pectipro suspension should not be used beyond the expiry date printed on the package. 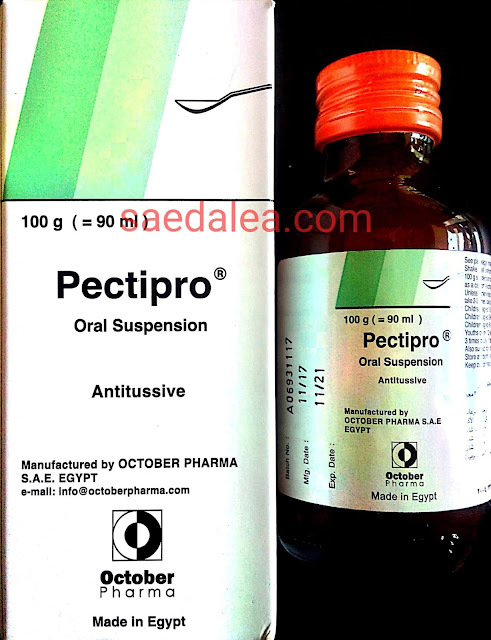 Store at room temperature Pectipro suspension is also suited for diabetics. Shake well before use ! PRESENTATION : Carton box contains glass bottle of 100 gm with pamphlet. sold the medicament. - The doctor and the pharmacist are experts in medicine, its benefits and risks. - Do not by yourself interrupt the period of treatment prescribed for you. - Do not repeat the same prescription without consulting your doctor. Manufactured by: October Pharma S.A.E.